Would you ever consider serving ice cream at your wedding instead of the traditional wedding cake? Thanks to Blue Bell Ice Cream you can have both now. This morning, the dairy in Texas announced that it will bring a new taste to the market just in time for the start of the high season, and that sounds absolutely delicious. The wedding cake is an almond ice cream with pieces of white cake and a strudel of cream cheese hinge Amaretto. 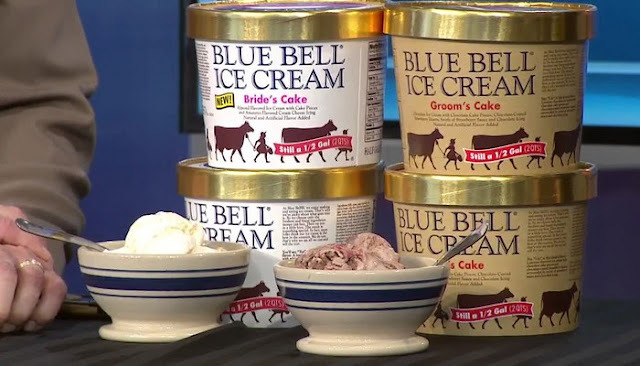 "We've heard that fans are serving Blue Bell Ice Cream at their weddings instead of traditional cakes, now you can have both," said Jenny Van Dorf, PR Manager at Blue Bell in a press release. " Our wedding cake, with its almond ice cream and amaretto cream cheese glaze, is inspired by the popular flavors of the wedding cakes. But that is not everything. They also bring wedding cake, a chocolate ice cream with chocolate cake, strawberry-coated chocolate hearts and spirals with strawberry sauce and chocolate glaze. "We presented Groom's Cake 2009," Van Dorf said. "The idea came from a real friend cake that one of our colleagues tried on a family wedding, and we are happy to bring the ice cream from the groom's pie to our line and combine it with our new wedding cake ice cream. The white cakes really bring that full circle. Soft and light like the purse of the bride's father. In the end, the wedding cake is the delicious, friendly and sweet taste that you would expect. So grab your friends, bring a spoon and prepare for the day you took your first cup or a cone with treats. Now we go to the groom's cake. Blue Bell says it is "delicious chocolate ice cream with chocolate cake and chocolate-coated strawberry hearts surrounded by strawberry sauce and swirling chocolate icing." I know, it feels a lot. But relax, that is easy (just like many friends). Chocolate with chocolate, a little strawberry and then a bit more chocolate. That is it, pieces of chocolate cake lightly flares in your mouth and chocolate-covered chocolate hearts are sprinkled like rose petals in the way that you spoon brings to your mouth. The Strawberry Sauce strudel adds the right note of nervousness, something like those Superman socks that all worship godfathers and hide from the bride's mother. Finally, I could not tell you exactly why the groom's cake was so good. I mean, it was like standing there with a smile on my face as everyone in the room wondered how he should be in the world where he was, but I cannot blame him for that. Now these products can be sold separately, but it seems wrong to eat them alone. But let me warn you: shoppers must be careful if you have both bowls too close together. I made that mistake and a few minutes later I found one of the Blue Bell minicups in my fridge. Now I have to explain exactly how this happened to the children. Well, here are more Blue Bell babies for all of us, the health of the bride and groom! Today is the launch of a new taste of Blue Bell Ice Cream - Bridal Cake! While in 2009 a delicious cake chocolate flavor was launched on the groom, harder to discover taste of a traditional wedding cake was only caught this year. A Blue Bell spokesperson said the company was inspired by newlyweds who served Blue Bell ice cream during their wedding reception. The exact inspiration for Bride's Cake has not been discussed, but the company says that Groom's Cake was actually inspired by a real cake that a wedding employee had. While Groom's Cake was not on the market for a while, he returned to his girlfriend. Both rich flavors are here only for a special occasion, which means that they have a limited release. The next time you visit your local supermarket, you must say "yes" to the ice. Ice is not always the wedding cake, but the latest taste of Blue Bell is. The ice cream parlor introduced Bride's Cake, an almond ice cream with white pieces of cake surrounded by a rich amaretto cream. How good does that sound? To accompany the new flavor version, Blue Bell brings a different taste of the past with regard to the wedding: wedding cakes. It is a chocolate ice cream with pieces of chocolate cake and chocolate covered hearts surrounded by swirls of strawberry sauce and strawberries in chocolate icing. Vanilla and chocolate ice cream sounds like the perfect combination, and you certainly do not have to plan your own wedding to enjoy the duo. Every taste is now available for a limited time, so make sure you choose one for yourself or for the bride or groom in your life. Jenny Van Dorf, PR Manager at Blue Bell, in a press release.